Illustrations: 10 b&w illustrations, 276 line figures, 27 tables. In his monumental 1687 work, Philosophiae Naturalis Principia Mathematica, known familiarly as the Principia, Isaac Newton laid out in mathematical terms the principles of time, force, and motion that have guided the development of modern physical science. Even after more than three centuries and the revolutions of Einsteinian relativity and quantum mechanics, Newtonian physics continues to account for many of the phenomena of the observed world, and Newtonian celestial dynamics is used to determine the orbits of our space vehicles. 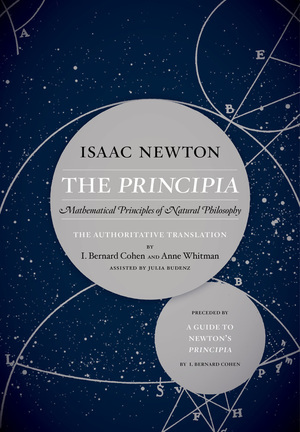 This authoritative, modern translation by I. Bernard Cohen and Anne Whitman, the first in more than 285 years, is based on the 1726 edition, the final revised version approved by Newton; it includes extracts from the earlier editions, corrects errors found in earlier versions, and replaces archaic English with contemporary prose and up-to-date mathematical forms. The illuminating Guide to Newton's Principia by I. Bernard Cohen makes this preeminent work truly accessible for today's scientists, scholars, and students. I. Bernard Cohen (1914–2003) was Victor S. Thomas Professor of the History of Science at Harvard University. He was the author of Benjamin Franklin's Science, Interactions, and Science and the Founding Fathers. Anne Whitman (1937–1984) was coeditor (with I. Bernard Cohen and Alexander Koyré) of the Latin edition, with variant readings, of the Principia. Julia Budenz, author of From the Gardens of Flora Baum, is a multilingual classicist and poet.